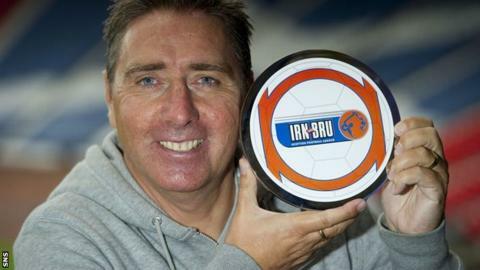 Jim McInally has been named manager of the month for August in Division Three after it ended with Peterhead top of a table that includes Rangers. The Blue Toon started the month by giving the side who came down from the Scottish Premier League a tough time in a 2-2 draw at Balmoor Stadium. They followed that with a 2-0 win away to Clyde and a 1-0 victory at home to Queen's Park. A 2-0 win over Montrose on 1 September puts them a point ahead of Clyde. McInally's side had hinted at the good form that would result in an Irn Bru award at the end of July when they came close to knocking top-flight newcomers Dundee out of the Scottish Communities League Cup. His former club only progressed after a penalty shoot-out following a 0-0 draw at Balmoor. The 48-year-old former Nottingham Forest, Dundee United and Scotland midfielder is in his second season with Peterhead having taken over from the sacked John Sheran in October. McInally has previously managed Sligo Rovers, Morton and in Division Three with East Stirlingshire.